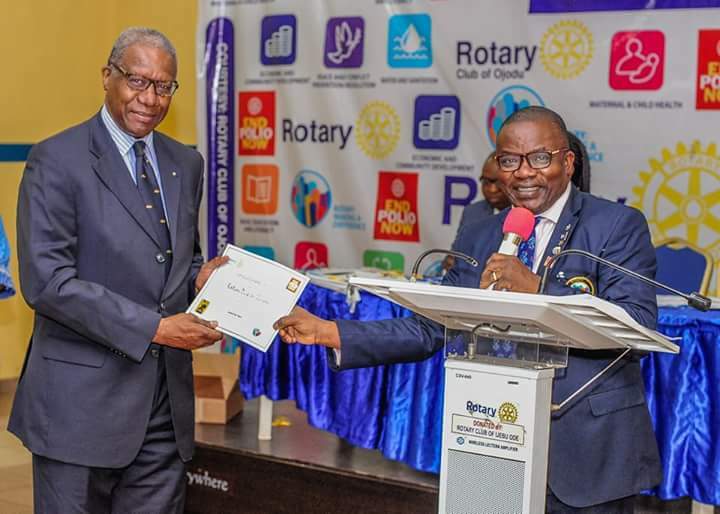 To mark the end of year 2017, the District Governor, Rotary International, District 9110, Nigeria, Rotarian Dr. Wale Ogunbadejo has just released an update on the district’s affairs for the first half of the 2017-18 Rotary year. 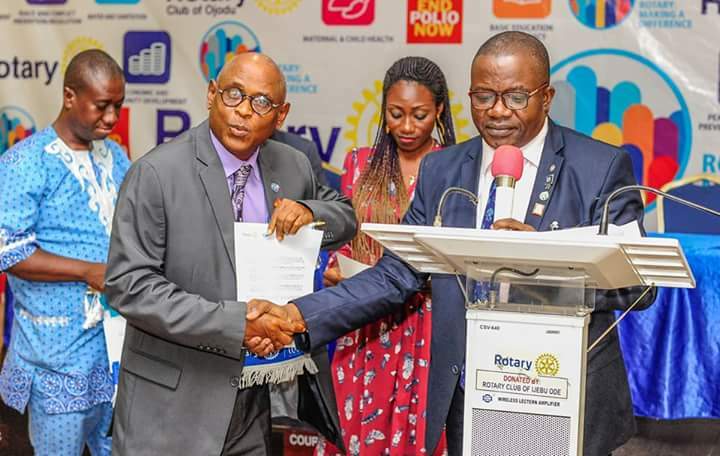 DG Ogunbadejo released the update during the mid-year review with Rotary Club Presidents, Assistant Governors, Committee Chairs and Zonal Coordinators, which was held at the Rotary centre on Wednesday, December 20, 2017. 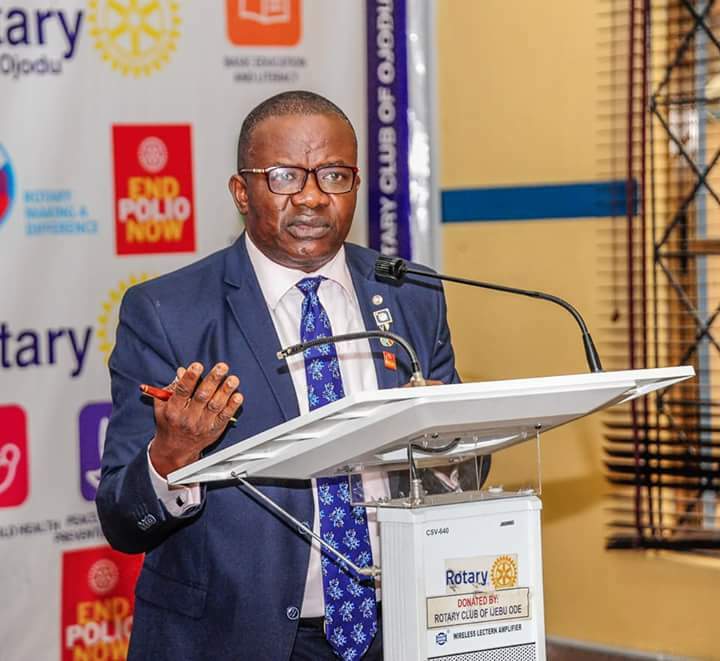 The areas covered by the DG’s review include DG’s installation, official club visits, districts dues, beautification and lift of the Rotary centre, membership recruitment and extension, the Rotary Foundation, district grant, training programmes and late Rotary International (RI) President Elect, Sam Owori who died in July 2017. 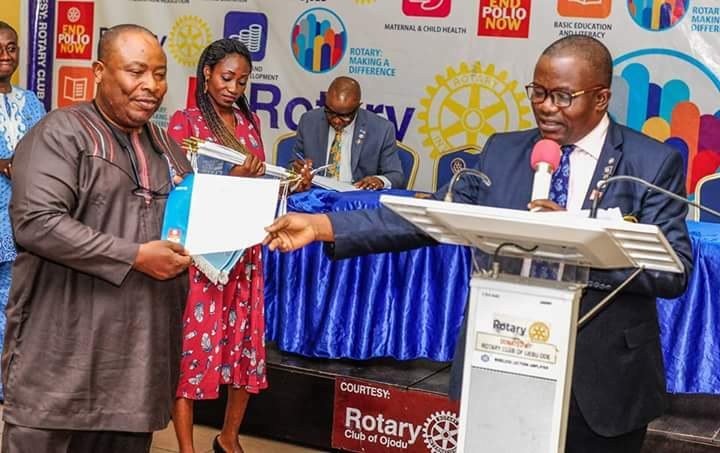 Others areas covered by the DGF’s review include Facebook live streaming program, West African project fair, zonal institute, world greatest meal, late PDG Bob Ogbuagu, Rotary Youth Leadership Awards (RYLA) 2017, donations to victims of Makurdi flood disaster, family of Rotary and vocational training centre. 75 clubs have been visited so far. Earlier this Rotary year, the district embarked on a “Clean Up” project of the entire Rotary Centre which includes trimming down of trees, evacuation of septic tank, as well as painting facelift thereby giving the Rotary Centre a better and cleaner look. The general lighting of both the building and premises was also carried out with the support of the Pacesetter President of Rotary Club of Yaba. The district has also acquired two new petrol generators with each one serving the district office and Majiyagbe building, on-going improved security systems and general maintenance of the centre. Currently, the District has 100 clubs with a total membership of 2, 687 translating to a net gain of 235 members as at today. 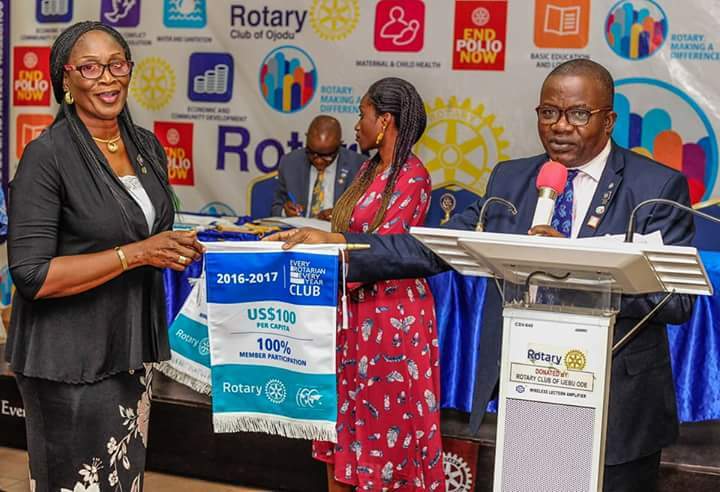 The number of requests to join Rotary from the membership leads referral from RI and the district website which was activated earlier in the year, has been on the upsurge since the beginning of the Rotary year. In the area of Rotary Foundation, the Governor thanked everyone who has contributed or introduced a donor this Rotary year. The DG disclosed that that the district grant for this year was recently approved by the Rotary Foundation. Therefore, the district has commenced the disbursement of funds to the qualified clubs who met the requirements and will continue disbursement of other approved grants as soon as the clubs meet the requirements. Rotary Club of Lagos Mainland, Rotary Club of Festac town, Rotary Club of Ogudu G.R.A., Rotary Club of Lagos Central and Rotary Club of Victoria Garden City. Governor was held on Saturday, August 19, 2017 at the Rotary Centre in Ikeja, which enabled the District Governor share the Rotary story of our good deeds across Nigeria, Africa and beyond. The Facebook Live programme was geared towards awareness campaign, boosting the public image of Rotary. The district was also well represented at the 12th West Africa Project Fair, held in Ghana. The Rotary Institute for Zone 20A was held in Johannesburg, South Africa from September 10 to September 17, 2017. The district won the following awards for the 2016/2017 Rotary year. We were also recognized as an all-giving district with all the clubs, recognized as contributors to Polio-Plus Fund. This was achievable through the generous contribution by the district on behalf of all the clubs in the district, the DG said. 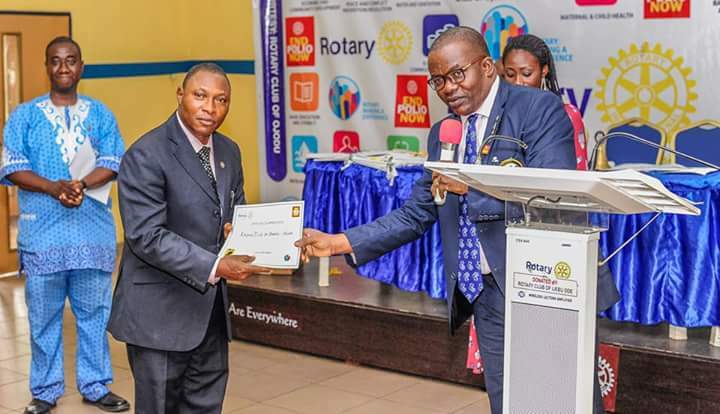 The clubs that have been recognized as 100% all-member-giving club include RC Akowonjo, RC Gbagada South, RC Ikate, RC Ikeja, RC Ikorodu Metropolitan, RC Isolo Golden, RC Iwaya, RC Lagos Mainland, RC Magodo Central, RC Maryland, RC Lagos, RC Ogudu G.R.A., RC Okota, RC Omole-Golden, and RC Omole-Ojodu. Also, to commemorate the World Polio Day, the district organized the “World’s Greatest Meal” event at the first “Evening with the District Governor” held on September 29, 2017 to raise fund for Polio. The event was applauded by the WGL Coordinator as the “Best Ever Event from Nigeria”. 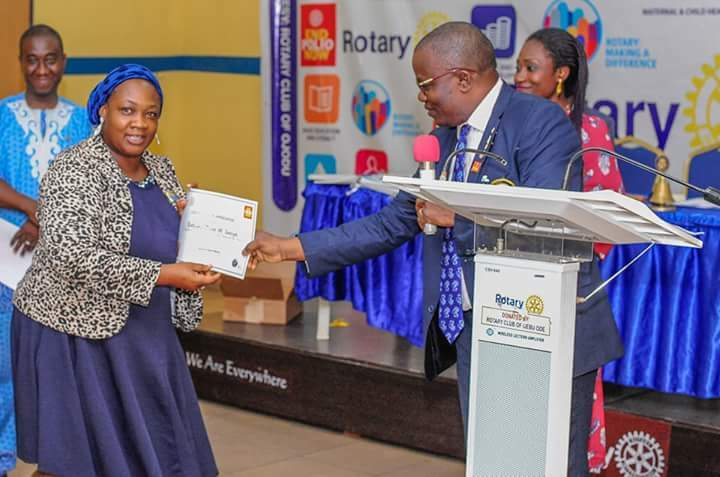 This year’s RYLA which took place between November 25 and December 3, was well attended by 353 participants, and sponsored by 54 clubs, inner wheel and Oriade Local Council Development Area. This year’s RYLA was a RYLA with a difference as this is the first time we have such huge participants and record-breaking profit through a prudent and diligent financial management. President Juliet Shobanjo, organised a family picnic at Police College, Ikeja on December 9, 2017 and it was such a huge success. During the year, the district laid the foundation of the Vocational Training Centre at Igbogbo, Ikorodu on Wednesday, October 11, 2017 and district leaders were well represented. “I am pleased to inform you that the work is going on progressively”, DG Ogunbadejo said.